Colorado (/ˌkɒləˈrædoʊ, –ˈrɑːdoʊ/ ( listen), other variants) is a state of the Western United States encompassing most of the southern Rocky Mountains as well as the northeastern portion of the Colorado Plateau and the western edge of the Great Plains. It is the 8th most extensive and 21st most populous U.S. state. The estimated population of Colorado was 5,695,564 on July 1, 2018, an increase of 13.25% since the 2010 United States Census. 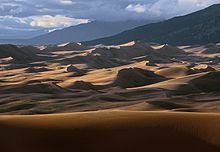 Colorado is notable for its diverse geography, which includes alpine mountains, high plains, deserts with huge sand dunes, and deep canyons. In 1861, the United States Congress defined the boundaries of the new Territory of Colorado exclusively by lines of latitude and longitude, stretching from 37°N to 41°N latitude, and from 102°02’48″W to 109°02’48″W longitude (25°W to 32°W from the Washington Meridian). After 158 years of government surveys, the borders of Colorado are now officially defined by 697 boundary markers and 697 straight boundary lines. Colorado, Wyoming and Utah are the only states that have their borders defined solely by straight boundary lines with no natural features. The southwest corner of Colorado is the Four Corners Monument at 36°59’56″N, 109°2’43″W. This is the only place in the United States where four states meet: Colorado, New Mexico, Arizona, and Utah. 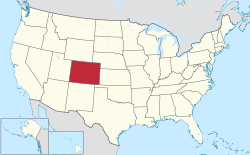 Roughly 70% of Colorado’s population resides along the eastern edge of the Rocky Mountains in the Front Range Urban Corridor between Cheyenne, Wyoming, and Pueblo, Colorado. This region is partially protected from prevailing storms that blow in from the Pacific Ocean region by the high Rockies in the middle of Colorado. The “Front Range” includes Denver, Boulder, Fort Collins, Loveland, Castle Rock, Colorado Springs, Pueblo, Greeley, and other townships and municipalities in between. On the other side of the Rockies, the significant population centers in Western Colorado (which is not considered the “Front Range”) are the cities of Grand Junction, Durango, and Montrose. Grand Junction, Colorado is the largest city on the Western Slope. Grand Junction and Durango are the only major centers of television broadcasting west of the Continental Divide in Colorado, though most mountain resort communities publish daily newspapers. Grand Junction is located along Interstate 70, the only major highway in Western Colorado. Grand Junction is also along the major railroad of the Western Slope, the Union Pacific. This railroad also provides the tracks for Amtrak‘s California Zephyr passenger train, which crosses the Rocky Mountains between Denver and Grand Junction via a route on which there are no continuous highways. The Eastern Plains are part of the extreme western portion of Tornado Alley; some damaging tornadoes in the Eastern Plains include the 1990 Limon F3 tornado and the 2008 Windsor EF3 tornado, which devastated the small town. The plains are also susceptible to occasional floods, which are caused both by thunderstorms and by the rapid melting of snow in the mountains during warm weather. Notable examples include the 1965 Denver Flood, the Big Thompson River flooding of 1976 and the 2013 Colorado floods. Hot weather is common during summers in Denver. The city’s record in 1901 for the number of consecutive days above 90 °F (32 °C) was broken during the summer of 2008. The new record of 24 consecutive days surpassed the previous record by almost a week. Much of Colorado is a very dry state averaging only 17 inches (430 millimeters) of precipitation per year statewide and rarely experiences a time when some portion of the state is not in some degree of drought. The lack of precipitation contributes to the severity of wildfires in the state, such as the Hayman Fire of 2002, one of the largest wildfires in American history, and the Fourmile Canyon Fire of 2010, which until the Waldo Canyon Fire and High Park Fire of June 2012, and the Black Forest Fire of June 2013, was the most destructive wildfire in Colorado’s recorded history. On August 22, 2011, a 5.3 magnitude earthquake occurred 9 miles (14 km) west-southwest of the city of Trinidad. There were no casualties and only a small amount of damage was reported. It was the second-largest earthquake in Colorado’s history. A magnitude 5.7 earthquake was recorded in 1973. Most American settlers traveling overland west to the Oregon Country, namely the new goldfields of California, or the new Mormon settlements of the State of Deseret in the Salt Lake Valley, avoided the rugged Southern Rocky Mountains, and instead followed the North Platte River and Sweetwater River to South Pass (Wyoming), the lowest crossing of the Continental Divide between the Southern Rocky Mountains and the Central Rocky Mountains. In 1849, the Mormons of the Salt Lake Valley organized the extralegal State of Deseret, claiming the entire Great Basin and all lands drained by the rivers Green, Grand, and Colorado. The federal government of the U.S. flatly refused to recognize the new Mormon government, because it was theocratic and sanctioned plural marriage. Instead, the Compromise of 1850 divided the Mexican Cession and the northwestern claims of Texas into a new state and two new territories, the state of California, the Territory of New Mexico, and the Territory of Utah. On April 9, 1851, Mexican American settlers from the area of Taos settled the village of San Luis, then in the New Mexico Territory, later to become Colorado’s first permanent Euro-American settlement. 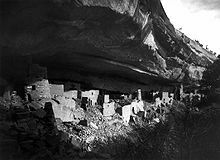 The United States Congress passed an enabling act on March 3, 1875, specifying the requirements for the Territory of Colorado to become a state. On August 1, 1876 (four weeks after the Centennial of the United States), U.S. President Ulysses S. Grant signed a proclamation admitting Colorado to the Union as the 38th state and earning it the moniker “Centennial State”. 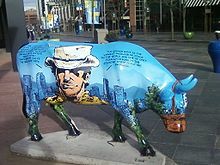 Colorado became the first western state to host a major political convention when the Democratic Party met in Denver in 1908. By the U.S. Census in 1930, the population of Colorado first exceeded one million residents. Colorado suffered greatly through the Great Depression and the Dust Bowl of the 1930s, but a major wave of immigration following World War II boosted Colorado’s fortune. Tourism became a mainstay of the state economy, and high technology became an important economic engine. The United States Census Bureau estimated that the population of Colorado exceeded five million in 2009. The United States Census Bureau estimates that the population of Colorado was 5,695,564 on July 1, 2018, a 13.25% increase since the 2010 United States Census. Colorado’s most populous city and capital, is Denver. The Greater Denver Metropolitan Area, with an estimated 2017 population of 3,515,374, is considered the largest metropolitan area within the state and is found within the larger Front Range Urban Corridor, home to around 5,000,000 people. The largest increases are expected in the Front Range Urban Corridor, especially in the Denver metropolitan area. The state’s fastest-growing counties are Douglas and Weld. 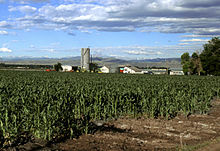 The center of population of Colorado is located just north of the village of Critchell in Jefferson County. Colorado has a high proportion of Hispanic, mostly Mexican-American, citizens in Metropolitan Denver, Colorado Springs, as well as the smaller cities of Greeley and Pueblo, and elsewhere. Southern, Southwestern, and Southeastern Colorado has a large number of Hispanos, the descendants of the early Mexican settlers of colonial Spanish origin. In 1940, the Census Bureau reported Colorado’s population as 8.2% Hispanic and 90.3% non-Hispanic white. The Hispanic population of Colorado has continued to grow quickly over the past decades. By 2012, Hispanics made up 21% of Colorado’s population, and Non-Hispanic Whites made up 69%. Spoken English in Colorado has many Spanish idioms. Colorado also has some large African-American communities located in Denver, in the neighborhoods of Montbello, Five Points, Whittier, and many other East Denver areas. A relatively large population of African Americans are also found in Colorado Springs on the east and southeast side of the city. The state has sizable numbers of Asian-Americans of Mongolian, Chinese, Filipino, Korean, Southeast Asian, and Japanese descent. The highest population of Asian Americans can be found on the south and southeast side of Denver, as well as some on Denver’s southwest side. The Denver metropolitan area is considered more liberal and diverse than much of the state when it comes to political issues and environmental concerns. In 2011, 46% of Colorado’s population younger than the age of one were minorities, meaning that they had at least one parent who was not non-Hispanic white. There are also a number of established film festivals in Colorado, including Aspen Shortsfest, Boulder International Film Festival, Castle Rock Film Festival, Denver Film Festival, Festivus Film Festival (ended in 2013), Mile High Horror Film Festival, Moondance International Film Festival, Mountainfilm in Telluride, Rocky Mountain Women’s Film Festival, and Telluride Film Festival. 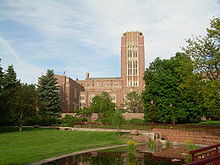 Boulder, Colorado was named America’s Foodiest Town 2010 by Bon Appétit. Boulder, and Colorado in general, is home to a number of national food and beverage companies, top-tier restaurants and farmers’ markets. Boulder, Colorado also has more Master Sommeliers per capita than any other city, including San Francisco and New York. Colorado wines include award-winning varietals that have attracted favorable notice from outside the state. With wines made from traditional Vitis vinifera grapes along with wines made from cherries, peaches, plums and honey, Colorado wines have won top national and international awards for their quality. Colorado’s grape growing regions contain the highest elevation vineyards in the United States, with most viticulture in the state practiced between 4,000 and 7,000 feet (1,219 and 2,134 m) above sea level. The mountain climate ensures warm summer days and cool nights. Colorado is home to two designated American Viticultural Areas of the Grand Valley AVA and the West Elks AVA, where most of the vineyards in the state are located. However, an increasing number of wineries are located along the Front Range. In 2018, Wine Enthusiast Magazine named Colorado’s Grand Valley AVA in Mesa County, Colorado, as one of the Top Ten wine travel destinations in the world. Colorado is home to many nationally praised microbreweries, including New Belgium Brewing Company, Odell Brewing Company, Great Divide Brewing Company, and Bristol Brewing Company. The area of northern Colorado near and between the cities of Denver, Boulder, and Fort Collins is known as the “Napa Valley of Beer” due to its high density of craft breweries. Colorado is open to cannabis (marijuana) tourism. With the adoption of their 64th state amendment in 2013, Colorado became the first state in the union to legalize the medicinal (2000), industrial (2013), and recreational (2014) use of marijuana. Colorado’s marijuana industry sold $1.31 billion worth of marijuana in 2016 and $1.26 billion in the first three quarters of 2017. The state generated tax, fee, and license revenue of $194 million in 2016 on legal marijuana sales. Colorado regulates hemp as any part of the plant with less than 0.3% THC. Amendment 64, adopted by the voters in the 2012 general election, forces the Colorado state legislature to enact legislation governing the cultivation, processing and sale of recreational marijuana and industrial hemp. 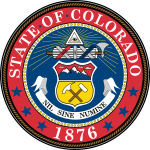 On April 4, 2014, Senate Bill 14–184 addressing oversight of Colorado’s industrial hemp program was first introduced, ultimately being signed into law by Governor John Hickenlooper on May 31, 2014. Currently Colorado has listed “eight medical conditions for which patients can use marijuana—cancer, glaucoma, HIV/AIDS, muscle spasms, seizures, severe pain, severe nausea and cachexia, or dramatic weight loss and muscle atrophy.” Colorado Governor John Hickenlooper has allocated about half of the state’s $13 million “Medical Marijuana Program Cash Fund” to medical research in the 2014 budget. On November 6, 2012, voters amended the state constitution to protect “personal use” of marijuana for adults, establishing a framework to regulate marijuana in a manner similar to alcohol. The first recreational marijuana shops in Colorado, and by extension the United States, opened their doors on January 1, 2014. The Cherry Hills Country Club has hosted several professional golf tournaments, including the U.S. Open, U.S. Senior Open, U.S. Women’s Open, PGA Championship and BMW Championship. CNBC’s list of “Top States for Business for 2010” has recognized Colorado as the third-best state in the nation, falling short to only Texas and Virginia. The total state product in 2015 was $318,600 million. Median Annual Household Income in 2016 was $70,666, 8th in the nation. Per capita personal income in 2010 was $51 940, ranking Colorado 11th in the nation. The state’s economy broadened from its mid-19th-century roots in mining when irrigated agriculture developed, and by the late 19th century, raising livestock had become important. Early industry was based on the extraction and processing of minerals and agricultural products. Current agricultural products are cattle, wheat, dairy products, corn, and hay. The federal government is also a major economic force in the state with many important federal facilities including NORAD (North American Aerospace Defense Command), United States Air Force Academy, Schriever Air Force Base located approximately 10 miles (16 kilometers) east of Peterson Air Force Base, and Fort Carson, both located in Colorado Springs within El Paso County; NOAA, the National Renewable Energy Laboratory (NREL) in Golden, and the National Institute of Standards and Technology in Boulder; U.S. Geological Survey and other government agencies at the Denver Federal Center near Lakewood; the Denver Mint, Buckley Air Force Base, the Tenth Circuit Court of Appeals, and the Byron G. Rogers Federal Building and United States Courthouse in Denver; and a federal Supermax Prison and other federal prisons near Cañon City. In addition to these and other federal agencies, Colorado has abundant National Forest land and four National Parks that contribute to federal ownership of 24,615,788 acres (99,617 km2) of land in Colorado, or 37% of the total area of the state. In the second half of the 20th century, the industrial and service sectors have expanded greatly. The state’s economy is diversified, and is notable for its concentration of scientific research and high-technology industries. Other industries include food processing, transportation equipment, machinery, chemical products, the extraction of metals such as gold (see Gold mining in Colorado), silver, and molybdenum. Colorado now also has the largest annual production of beer of any state. Denver is an important financial center. A number of nationally known brand names have originated in Colorado factories and laboratories. From Denver came the forerunner of telecommunications giant Qwest in 1879, Samsonite luggage in 1910, Gates belts and hoses in 1911, and Russell Stover Candies in 1923. Kuner canned vegetables began in Brighton in 1864. From Golden came Coors beer in 1873, CoorsTek industrial ceramics in 1920, and Jolly Rancher candy in 1949. CF&I railroad rails, wire, nails, and pipe debuted in Pueblo in 1892. Holly Sugar was first milled from beets in Holly in 1905, and later moved its headquarters to Colorado Springs. The present-day Swift packed meat of Greeley evolved from Monfort of Colorado, Inc., established in 1930. Estes model rockets were launched in Penrose in 1958. Fort Collins has been the home of Woodward Governor Company‘s motor controllers (governors) since 1870, and Waterpik dental water jets and showerheads since 1962. Celestial Seasonings herbal teas have been made in Boulder since 1969. Rocky Mountain Chocolate Factory made its first candy in Durango in 1981. Colorado has a flat 4.63% income tax, regardless of income level. Unlike most states, which calculate taxes based on federal adjusted gross income, Colorado taxes are based on taxable income—income after federal exemptions and federal itemized (or standard) deductions. Colorado’s state sales tax is 2.9% on retail sales. When state revenues exceed state constitutional limits, according to Colorado’s Taxpayer Bill of Rights legislation, full-year Colorado residents can claim a sales tax refund on their individual state income tax return. Many counties and cities charge their own rates, in addition to the base state rate. There are also certain county and special district taxes that may apply. Real estate and personal business property are taxable in Colorado. The state’s senior property tax exemption was temporarily suspended by the Colorado Legislature in 2003. The tax break was scheduled to return for assessment year 2006, payable in 2007. As of December 2018[update], the state’s unemployment rate was 4.2%. Colorado has significant hydrocarbon resources. According to the Energy Information Administration, Colorado hosts seven of the Nation’s 100 largest natural gas fields, and two of its 100 largest oil fields. Conventional and unconventional natural gas output from several Colorado basins typically account for more than 5 percent of annual U.S. natural gas production. Colorado’s oil shale deposits hold an estimated 1 trillion barrels (160 km3) of oil—nearly as much oil as the entire world’s proven oil reserves; the economic viability of the oil shale, however, has not been demonstrated. Substantial deposits of bituminous, subbituminous, and lignite coal are found in the state. Colorado’s high Rocky Mountain ridges and eastern plains offer wind power potential, and geologic activity in the mountain areas provides potential for geothermal power development. Much of the state is sunny, and could produce solar power. Major rivers flowing from the Rocky Mountains offer hydroelectric power resources. Corn grown in the flat eastern part of the state offers potential resources for ethanol production. Colorado’s primary mode of transportation (in terms of passengers) is its highway system. 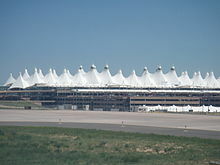 Interstate 25 (I-25) is the primary north–south highway in the state, connecting Pueblo, Colorado Springs, Denver, and Fort Collins, and extending north to Wyoming and south to New Mexico. I-70 is the primary east–west corridor. 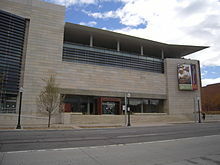 It connects Grand Junction and the mountain communities with Denver, and enters Utah and Kansas. The state is home to a network of US and Colorado highways that provide access to all principal areas of the state. Many smaller communities are only connected to this network via county roads. Extensive public transportation bus services are offered both intra-city and inter-city—including the Denver metro area’s extensive RTD services. The Regional Transportation District (RTD) operates the popular RTD Bus & Rail transit system in the Denver Metropolitan Area. As of January 2013[update] the RTD rail system had 170 light-rail vehicles, serving 47 miles (76 km) of track. 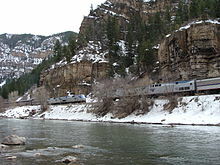 Amtrak operates two passenger rail lines in Colorado, the California Zephyr and Southwest Chief. 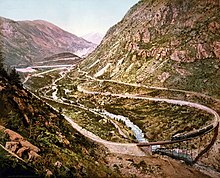 Colorado’s contribution to world railroad history was forged principally by the Denver and Rio Grande Western Railroad which began in 1870 and wrote the book on mountain railroading. 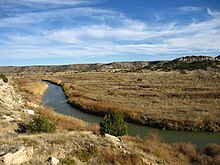 In 1988 the “Rio Grande” acquired, but was merged into, the Southern Pacific Railroad by their joint owner Philip Anschutz. On September 11, 1996, Anschutz sold the combined company to the Union Pacific Railroad, creating the largest railroad network in the United States. The Anschutz sale was partly in response to the earlier merger of Burlington Northern and Santa Fe which formed the large Burlington Northern and Santa Fe Railway (BNSF), Union Pacific’s principal competitor in western U.S. railroading. Both Union Pacific and BNSF have extensive freight operations in Colorado. Colorado’s freight railroad network consists of 2,688 miles of Class I trackage. It is integral to the U.S. economy, being a critical artery for the movement of energy, agriculture, mining, and industrial commodities as well as general freight and manufactured products between the East and Midwest and the Pacific coast states. Like the federal government and all other U.S. states, Colorado’s state constitution provides for three branches of government: the legislative, the executive, and the judicial branches. The Governor of Colorado heads the state’s executive branch. The current governor is Jared Polis, a Democrat. Colorado’s other statewide elected executive officers are the Lieutenant Governor of Colorado (elected on a ticket with the Governor), Secretary of State of Colorado, Colorado State Treasurer, and Attorney General of Colorado, all of whom serve four-year terms. The state legislative body is the Colorado General Assembly, which is made up of two houses, the House of Representatives and the Senate. The House has 65 members and the Senate has 35. As of 2018[update], the Democratic Party holds a 19 to 16 majority in the Senate and a 41 to 24 majority in the House. Most Coloradans are native to other states (nearly 60% according to the 2000 census), and this is illustrated by the fact that the state did not have a native-born governor from 1975 (when John David Vanderhoof left office) until 2007, when Bill Ritter took office; his election the previous year marked the first electoral victory for a native-born Coloradan in a gubernatorial race since 1958 (Vanderhoof had ascended from the Lieutenant Governorship when John Arthur Love was given a position in Richard Nixon‘s administration in 1973). In the 2016 election, the Democratic party won the Colorado electoral college votes. As directed by statute, SCFD recipient organizations are currently divided into three “tiers” among which receipts are allocated by percentage. In 2012, voters amended the state constitution protecting “personal use” of marijuana for adults, establishing a framework to regulate cannabis in a manner similar to alcohol. The first recreational marijuana shops in Colorado, and by extension the United States, opened their doors on January 1, 2014. ^ “Lawmakers name ‘Rocky Mountain High’ second state song | 9news.com”. Archive.9news.com. March 13, 2007. Archived from the original on November 30, 2015. Retrieved April 1, 2016. ^ “Median Annual Household Income”. Retrieved December 9, 2016. 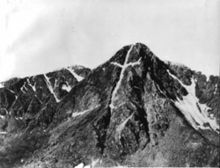 ^ a b “Mount Elbert”. NGS data sheet. U.S. National Geodetic Survey. Retrieved October 20, 2011. ^ a b c “Elevations and Distances in the United States”. United States Geological Survey. 2001. Archived from the original on October 15, 2011. Retrieved October 21, 2011. ^ a b c President of the United States of America (August 1, 1876). “Proclamation of the Admission of Colorado to the Union” (php). The American Presidency Project. Retrieved November 15, 2018. ^ “Colorado – Definition”. Merriam-webster.com. August 13, 2010. Retrieved June 5, 2011. ^ “Colorado – dictionary.reference.com”. Dictionary.com, LLC. Retrieved August 17, 2013. ^ Clark, Kyle (June 27, 2018). What’s the right way to pronounce ‘Colorado?’ (TV news magazine segment). Contributor: Rich Sandoval, linguist at Metropolitan State University of Denver. KUSA-TV. Retrieved August 4, 2018. [Sandoval] found five pronunciations. 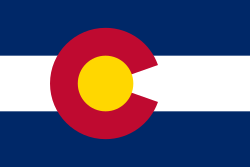 ^ a b c “QuickFacts Colorado; UNITED STATES”. 2018 Population Estimates. United States Census Bureau, Population Division. February 9, 2019. Retrieved February 9, 2019. ^ a b c “An Act to provide a temporary Government for the Territory of Colorado” (PDF). Thirty-sixth United States Congress. February 28, 1861. Retrieved November 15, 2018. ^ Quillen, Ed (March 18, 2007). “Coloradoan or Coloradan”. Denver Post. Retrieved July 30, 2010. ^ “Colorado is NOT a perfect rectangle”. Fascinating Maps. Retrieved November 15, 2018. 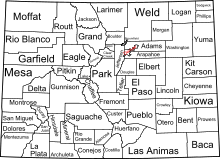 ^ a b “Colorado is a rectangle? Think again”. The Big Think, Inc. Retrieved November 15, 2018. ^ “Shared Solution: Four Corners”. NGS Survey Monument Data Sheet. United States National Geodetic Survey. May 7, 2003. 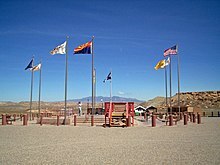 ^ The official Four Corners Monument is located at 36°59’56.31591″N, 109°2’42.62064″W, a short distance east of the 37°N, 109°02’48″W location Congress originally designated. ^ U.S. Geological Survey. “Elevations and Distances”. Archived from the original on January 16, 2008. Retrieved September 8, 2006. 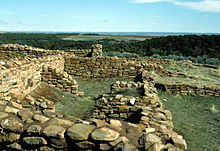 ^ “Colorado County Highpoints”. Retrieved February 27, 2012. ^ a b Doesken, Nolan J.; Pielke, Roger A., Sr.; Bliss, Odilia A.P. (January 2003). “Climate of Colorado”. Colorado Climate Center – Department of Atmospheric Science – Colorado State University. Archived from the original on February 9, 2009. Retrieved January 25, 2009. ^ U.S. Forest Service. “Rocky Mountain Region 14ers”. Retrieved November 6, 2009. ^ “Pikes Peak, Colorado”. Peakbagger.com. Retrieved October 10, 2009. ^ “Climate Of Colorado”. Wrcc.dri.edu. Retrieved April 1, 2016. ^ a b “Denver, Colorado Travel Weather Averages”. Weatherbase. Retrieved July 10, 2013. ^ “Relocating to Greenhorn Valley”. Retrieved February 9, 2017. ^ “Historic Denver Hailstorm Was Called Worst In American History”. July 11, 2014. ^ “Hailstorm that hammered west metro Denver May 8 is costliest ever for Colorado”. May 23, 2017. ^ Slater, Jane (May 28, 2008). “Thursday’s Tornado State’s 4th Costliest Disaster”. KMGH. ^ Prendergast, Alan (April 29, 2015). “The 1965 Flood: How Denver’s Greatest Disaster Changed the City”. ^ “Denver’s Consecutive 90 Degree Streaks”. National Weather Service. Retrieved October 10, 2009. ^ “A History of Drought” (PDF). Retrieved July 30, 2010. ^ “Record Highest Temperatures by State” (PDF). National Climatic Data Center. January 1, 2004. Archived from the original (PDF) on November 17, 2001. Retrieved January 11, 2007. ^ “Record Lowest Temperatures by State” (PDF). National Climatic Data Center. January 1, 2004. Archived from the original (PDF) on November 17, 2001. Retrieved January 11, 2007. ^ “NOAA’s National Weather Service – National Climate”. W2.weather.gov. Retrieved April 1, 2016. ^ “Largest Colorado quake since 1973 shakes homes”. USA Today. August 23, 2011. Retrieved August 23, 2011. ^ “Four earthquakes rumble Colorado overnight | OutThere Colorado”. OutThere Colorado. 2018-08-24. Retrieved 2018-09-10. ^ liz.forster@gazette.com, LIZ FORSTER. “3 earthquakes reported overnight in Colorado”. Colorado Springs Gazette. Retrieved September 10, 2018. ^ “Genocide Wiped Out Native American Population “, Discovery News, September 20, 2010. ^ Multiple Property Documentation Form. “National-Register-of-Historic” (PDF). www.nps.gov. ^ Forty-third United States Congress (March 3, 1875). “An Act to Enable the People of Colorado to Form a Constitution and State Government, and for the Admission of the Said State into the Union on an Equal Footing with the Original States” (PDF). Retrieved November 15, 2018. ^ Rebchook, John (October 15, 2015). “Neighbors want historic designation for NW Denver home”. ^ Resident Population Data. “Resident Population Data – 2010 Census”. 2010.census.gov. Archived from the original on October 19, 2013. Retrieved December 31, 2018. ^ “Population growth – Colorado counties”. Epodunk.com. Retrieved June 5, 2011. ^ “Population and Population Centers by State – 2000”. United States Census Bureau. Archived from the original on June 22, 2013. Retrieved December 4, 2008. ^ “Population of Colorado – Census 2010 and 2000 Interactive Map, Demographics, Statistics, Quick Facts”. CensusViewer.com. Retrieved April 1, 2016. ^ 2010 Census Data. “2010 Census Data – 2010 Census”. Census.gov. Retrieved April 1, 2016. ^ “Profile of General Population and Housing Characteristics: 2010 : 2010 Demographic Profile Data”. Factfinder2.census.gov. Archived from the original (PDF) on March 5, 2014. Retrieved April 1, 2016. ^ “Historical Census Statistics on Population Totals By Race, 1790 to 1990, and By Hispanic Origin, 1970 to 1990, For The United States, Regions, Divisions, and States”. U.S. Census Bureau. Archived from the original on December 24, 2014. Retrieved January 3, 2012. 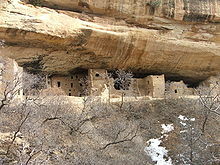 ^ “Colorado QuickFacts from the US Census Bureau”. Quickfacts.census.gov. Archived from the original on February 19, 2016. Retrieved April 1, 2016. ^ “talking about Colorado in “nada““. Elcastellano.org. June 30, 2007. Retrieved July 30, 2010. ^ “National Vital Statistics Reports, Volume 57, Number 12, (March 18, 2009)” (PDF). Retrieved July 30, 2010. ^ “Department of Public Health and Environment |”. Cdphe.state.co.us. Retrieved April 1, 2016. ^ “People of Colorado statistics”. StateMaster.com. June 15, 2007. Retrieved April 1, 2016. ^ “Losing ground” (PDF). Adworks.org. Retrieved April 1, 2016. ^ “Births: Final Data for 2013 Volume 64, Number 1” (PDF). National Vital Statistics Reports. January 15, 2015. Retrieved August 8, 2017. ^ “Births: Final Data for 2014 Volume 64, Number 12” (PDF). National Vital Statistics Reports. December 23, 2015. Retrieved August 8, 2017. ^ “Births: Final Data for 2015 Volume 66, Number 1” (PDF). National Vital Statistics Reports. January 5, 2017. Retrieved August 8, 2017. ^ Nvsr67_01.pdf. “National Vital Statistics Reports” (PDF). www.cdc.gov. ^ “Languages – Colorado”. www.city-data.com. ^ Adkins, Amy. “Mississippi and Alabama Most Protestant States in U.S”. Gallup.com. Retrieved April 1, 2016. ^ “Religion in America: U.S. Religious Data, Demographics and Statistics | Pew Research Center”. Religions.pewforum.org. Retrieved April 1, 2016. ^ “Percentage of Obese Adult Population” (GIF). Calorielab.com. Retrieved April 1, 2016. ^ “Fattest States 2010: CalorieLab’s Annual Obesity Map – State Obesity Rankings | CalorieLab – Health News & Information Blog”. CalorieLab. June 28, 2010. Retrieved June 5, 2011. ^ Dwyer-Lindgren, Laura (May 8, 2017). “Inequalities in Life Expectancy Among US Counties, 1980 to 2014”. Journal of the American Medical Association: Internal Medicine. 177 (7): 1003–1011. doi:10.1001/jamainternmed.2017.0918. PMC 5543324. PMID 28492829. Retrieved May 9, 2017. ^ Cangialosi, Jason. “Scenic Memorabilia: Colorado’s Film Locations”. Yahoo! Movies. Retrieved March 4, 2013. ^ Knowlton, Andrew. “America’s Foodiest Town 2010: Boulder, Colorado: In the Magazine”. bonappetit.com. Retrieved June 5, 2011. ^ Arnold, Katie (June 8, 2008). “As Skiers Depart Aspen, Chowhounds Take Their Place”. Aspen (Colo): Travel.nytimes.com. Retrieved June 5, 2011. ^ “Colorado Travel Guide”. Travelandleisure.com. Retrieved June 5, 2011. ^ Jackenthal, Stefani (October 5, 2008). “Biking Colorado’s Wine Country”. Colorado: Travel.nytimes.com. Retrieved June 5, 2011. ^ “The Jefferson Cup Invitational Wine Competition”. Thejeffersoncup.com. November 24, 2010. Archived from the original on May 1, 2011. Retrieved June 5, 2011. ^ “Wine Industry Feature Articles – Is Colorado the New Washington?”. Winesandvines.com. Retrieved June 5, 2011. ^ “Alcohol and Tobacco Tax and Trade Bureau : U.S. Department of the Treasury : Tables” (PDF). Ttb.gov. Archived from the original (PDF) on March 19, 2015. Retrieved April 1, 2016. ^ “Colorado Wine Industry Development Board”. Coloradowine.com. Archived from the original on April 28, 2011. Retrieved June 5, 2011. ^ “Grand Valley, Colorado – Top 10 Wine Getaways 2018 – Wine Enthusiast Magazine”. ^ “Colorado beer.org”. coloradobeer.org. Retrieved January 24, 2013. ^ “The Denver Beer Triangle”. Denver.org. Retrieved June 18, 2013. ^ Land Water People Time (Cultural Guide) (February 11, 2014). “A new Rocky Mountain high: Colorado open for cannabis tourism – The Santa Fe New Mexican: Travel”. The Santa Fe New Mexican. Retrieved April 1, 2016. ^ “Marijuana Sales Reports – Department of Revenue”. www.colorado.gov. ^ “Marijuana Tax Data – Department of Revenue”. www.colorado.gov. ^ “Industrial Hemp | Department of Agriculture – Plants”. Colorado.gov. March 30, 2015. Retrieved April 1, 2016. ^ “Colorado Senate Bill 14-184”. Retrieved October 13, 2014. ^ “Active State Medical Marijuana Programs – NORML”. norml.com. Archived from the original on May 3, 2008. Retrieved June 4, 2008. ^ “Full Text of Colorado Amendment 20 – Medical Use of Marijuana 2000”. Nationalfamilies.org. Retrieved April 1, 2016. ^ “ACLU Joins Campaign To Regulate Marijuana Like Alcohol – ACLU – Colorado”. Aclu-co.org. Retrieved April 1, 2016. ^ a b Healy, Jack. “Colorado Stores Throw Open Their Doors to Pot Buyers”. The New York Times. Retrieved January 1, 2014. Fencing, a coeducational sport with men’s and women’s squads, also competes as an independent. Men’s and women’s gymnastics both compete in the Mountain Pacific Sports Federation. Men’s ice hockey competes in Atlantic Hockey. Men’s lacrosse competes in the Southern Conference. Men’s soccer and women’s swimming & diving compete in the Western Athletic Conference. Men’s and women’s indoor track & field compete in the Mountain Pacific Sports Federation. Skiing, a coeducational sport with men’s and women’s squads, competes in the Rocky Mountain Intercollegiate Ski Association. Women’s gymnastics competes in the Big 12 Conference. Men’s ice hockey competes in the National Collegiate Hockey Conference. Men’s and women’s lacrosse compete in the Big East Conference. Baseball (a men-only sport) and women’s swimming & diving compete in the Western Athletic Conference. ^ Analysis, US Department of Commerce, BEA, Bureau of Economic. “Bureau of Economic Analysis”. www.bea.gov. Archived from the original on December 30, 2017. Retrieved April 24, 2018. ^ “Median Annual Household Income”. The Henry J. Kaiser Family Foundation. 2017-09-22. Retrieved 2018-10-11. ^ “References” (PDF). Archived from the original (PDF) on April 12, 2010. Retrieved July 30, 2010. ^ Frank, Tony (January 1997). “Colorado Land Ownership by County (acres)”. Colorado Department of Agriculture. Archived from the original (Excel) on January 16, 2006. Retrieved July 15, 2007. ^ “Colorado rides on Fat Tire to beer heights”. Rockymountainnews.com. November 24, 2007. Retrieved June 5, 2011. ^ “Local Area Unemployment Statistics Home Page”. Bls.gov. Retrieved February 4, 2019. ^ “Philanthropy in Colorado” (PDF). Colorado Association of Funders. Archived from the original (PDF) on October 19, 2013. ^ “EIA State Energy Profiles: Colorado”. June 12, 2008. Retrieved June 24, 2008. ^ “Railroads and States”. Aar.org. Archived from the original on June 6, 2013. Retrieved July 10, 2013. ^ Nicholson, Kieran (August 1, 2014). “Immigrants here illegally begin receiving Colorado driver licenses”. Denver Post. Retrieved August 1, 2014. ^ “524 Non-Citizens Received Regular Colorado Driver’s Licenses, DMV Says”. KCNC. Denver. September 12, 2014. Retrieved February 19, 2015. ^ “State of Residence in 2000 by State of Birth”. US Census Bureau. Retrieved October 10, 2009. ^ “Colorado Counties”. State of Colorado, Department of Local Affairs. January 8, 2007. Archived from the original on February 2, 2007. Retrieved January 30, 2007. ^ “OMB Bulletin No. 10-02: Update of Statistical Area Definitions and Guidance on Their Uses” (PDF). United States Office of Management and Budget. December 1, 2009. Retrieved January 7, 2010. ^ a b c “American Factfinder”. United States Census Bureau. Retrieved February 9, 2019. ^ “Active Colorado Municipalities”. State of Colorado, Department of Local Affairs. Archived from the original on November 23, 2010. Retrieved May 11, 2011. ^ “Colorado Local Government by Type”. State of Colorado, Department of Local Affairs. February 27, 2007. Archived from the original on February 2, 2007. Retrieved May 11, 2011. ^ “Total Registered Voters By Party Affiliation and Status As of Fri Apr 01 2016 03:07:45 GMT-0600 (MDT)” (PDF). Explore Colorado, A Naturalist’s Handbook, The Denver Museum of Natural History and Westcliff Publishers, 1995, ISBN 1-56579-124-X for an excellent guide to the ecological regions of Colorado. Gunther, John (1947). “–But Scenery Is Not Enough”. Inside U.S.A. New York, London: Harper & Brothers. pp. 213–226.